COLUMBUS, OHIO — SEPTEMBER 22, 2015 — Scriptel® Corporation (Scriptel), a long-time provider of electronic signature solutions and capacitive pen digitizing components, today announced that its ScripTouch Slimline, Desktop, Desktop LCD, Compact LCD and Magstripe electronic signature pads, in both the ProScript and EasyScript interface versions, have been verified as Citrix Ready®. The Citrix Ready program helps customers identify third-party solutions that are recommended to enhance virtualization, networking and cloud computing solutions from Citrix. The Scriptel signature pads completed a rigorous verification process to ensure compatibility with Citrix XenApp and Citrix XenDesktop virtualization systems, providing confidence in joint solution compatibility. Specific information on Citrix XenApp and Citrix XenDesktop version compatibility can be found at scriptel.com/support/citrix-ready. The Citrix Ready program makes it easy for customers to identify complementary products and solutions that can enhance Citrix environments. Customers can be confident that Scriptel signature pads have successfully passed a series of tests established by Citrix, and can be trusted to work effectively with XenApp and XenDesktop in order to deliver high-quality handwritten signatures to electronic documents, avoid error-prone and expensive print-sign-scan interactions with customers and vendors, and get that much closer to having a completely paperless operation. Scriptel’s ScripTouch series electronic signature pads all feature rugged construction and high reliability for frequent transactions and long lifetimes. Scriptel’s active battery-less tethered pen is proven to perform flawlessly through more than 1 million signatures. The signature sensing layer is mounted behind a solid signing surface for great device durability. Signature quality is not affected by wear or heavy use and there are no batteries to replace. The various form factors: Slimline (desktop ergonomic design, low-cost), Desktop and Desktop LCD (ideal for high-volume, countertop usage), Compact LCD (portable and convenient for field service and occasional use) and Magstripe (with integrated 3-track magnetic stripe reader), let the customer choose the device that fits their price point, environment and usage requirements. Citrix customers in the healthcare, financial, government, education, retail and other industries often require signatures on documents from customers, patients, service providers, students, visitors, vendors, etc. and still today many of those signatures are collected after printing a form on paper which is then often scanned into an electronic archiving system. Paper, printing and scanning slows interactions down, adds to operational cost and is also error-prone. Scriptel signature pads make it possible to capture an authentic handwritten signature on an electronic document without the printing and scanning steps and without the errors. Citrix Ready identifies recommended solutions that are trusted to enhance the Citrix mobile workspace infrastructure. 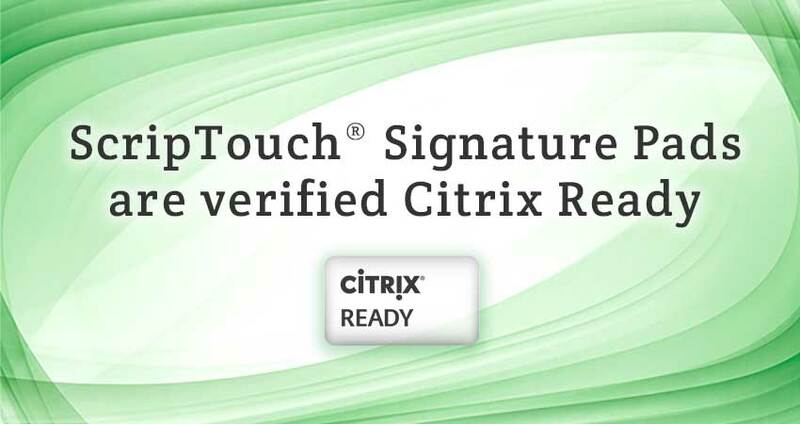 All products featured in Citrix Ready have completed verification testing, thereby providing confidence in joint solution compatibility. Leveraging its industry leading alliances and partner ecosystem, Citrix Ready showcases select trusted solutions designed to meet a variety of business needs. Through the online catalog and Citrix Ready branding program, you can easily find and build a trusted infrastructure. Citrix Ready not only demonstrates current mutual product compatibility, but through continued industry relationships also ensures future interoperability. Learn more at www.citrix.com/ready.